Here’s a first for the Albany City Council, at least in living memory: Unwilling to take a second long lecture from a man denied a permit to hold a marijuana festival in a city park, the mayor called a recess and the council walked out. It happened during an otherwise routine city council session Wednesday night. Under an agenda item called “business from the public,” Shane Lemco, of rural North Albany, talked to the council while wielding a video camera. As he did two weeks ago, he tried to convince the council that one or more Supreme Court precedents required the council to give him a hearing after the parks director denied his request for reserving Monteith Riverpark for an event he planned to organize in July. On April 12, also under “business from the public,” he had heatedly lectured the council for 20 minutes in what was supposed to be his appeal of the parks denial. He cited court cases and precedents on people’s rights to be heard but never got around to arguing why his reservation should have been approved. And the council finally voted 4-0 to uphold the denial without hearing anything about why the police department had recommended it. On Wednesday, Mayor Sharon Konopa told him not to go over the same ground again because the council had made its decision and could not reopen the issue unless requested by any of the four councilors who voted on the 12th. None of them moved to reconsider. 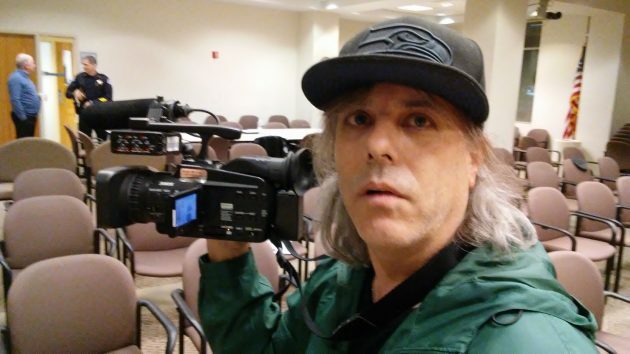 Shane Lemco with his video camera after addressing the council on Wednesday night. One wonders why our august City Moms and Pops didn’t walk out when a plan to move This Old Church came to light. Certainly the rescue of This Old Church, which the Mayor’s This Old Church Taskforce has wasted several hours on already, cannot be significantly more important than a marijuana gathering in Monteith Park. In fact, a ganja gathering in Monteith Park would likely bring in visitor dollars, whereas moving This Old Church is nothing but cost. Perhaps the City Council should walk on out the door and just continue walking. Couldn’t say it any better. Thank you. Congrats to the council for their patience with this long winded ideologue. Is there no protocol for ending a tirade in the council meeting short of forcing the members to walk out? Perhaps Herr Hering and those who share his political persuasion should consider putting Shane Lemco on the Conservative payroll. Conservative philosophy tells us that less government is preferable. If you accept this as gospel (who wouldn’t) then simply pay Lemco to attend EVERY city council session, including the alleged Monday evening work groups. Lemco could roll up with his HD video camera, zooming-in on City Moms and Pops as they attempt to legislate. Because Lemco seems to be a highly effective irritant, seemingly able to annoy and aggravate the Moms and Pops quickly, the Council, rather than actually listen, would be “taking a five minute recess,” effectively slowing the council’s ability to create new statutes. Conservatives, Lemco – the ganja gangster – could be the answer as you seek to limit government. Lemco’s rates are probably inexpensive, but his ability to shutter the Council’s efforts could be worth whatever they cost. That is, if you truly believe what you say you believe. You say toe-may-toe. I say toe-mah-toe. Allegedly, limited government is what you get when the more conservative of the two principal political parties controls all branches of government, like now. Normally, the GOP favors limited government. But these are anything but normal times. Republicans mastered limiting-government-by-obstruction (see 8-years of Obama) yet now, in 2017, that same reactionary gaggle seems clownishly incapable of limiting government through legislative action. The guy in the White House tries to make his signing nearly meaningless Executive Orders seem important. Instead, he’s sagebrush in Burns, blowing about aimlessly. The House Speaker, touted as a “wonk” on detail, is clearly struggling even with a clear majority. Who knows, GOP ineptitude might be the best way forward. Limiting government through sheer incompetence. Now there’s a campaign slogan. Hard to see what Hartman’s rambling about the federal government has to do with some guy having his say, at length, before the city council and then refusing to shut up when everybody else thinks he’s beating a dead horse. The two are intimately connected. I’d have thought you understood that. Oh! YOu’re pulling my leg. Please allow me to explain HH. Boil this hot mess down to the fine tipped point Mr. Hartman is making. Forget Lemco …for a minute or forever. Who cares? The Congress Critters at the National level are not all that dis-similar to the Council Critters we have sitting in Linn County. You see Republican is now clearly spelled out. It is H-Y-P-R-O-C-R-I-S-Y. Fear not though. The republican walls are beginning to show cracks. Example? Take the fact the feds are expanding their criminal probe into the hyprocrite party’s propaganda arm …Fox News. I’d drop a link but the internet is free for now so …. As for our “president”, he is just a simple grifter. Out to make a few trillion bucks for himself and family. Yuck! Hasso, of all people you certainly must understand and appreciate beating dead horses.